The Sentry Electronics Labs Electric Strike is designed for use with Sentry Safety panic exit bars. 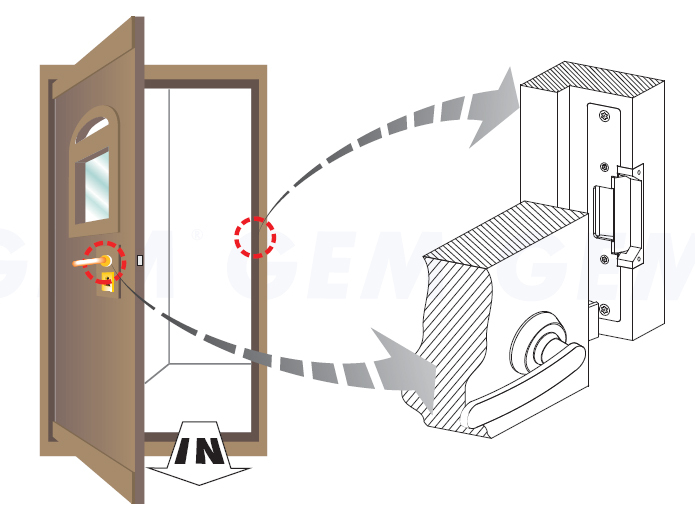 It is secured to the door jamb and gives the locking mechanism a component to engage so the door closes. This model is compatible with most wood door frames. Furthermore, customers can be assured of the durability of this accessory, due to its solenoid construction. It has 2000 lbs of jaw strength in pull testing and is tested to 1,000,000 cycles. This Sentry E. Labs electric strike is best used with wooden door frames. Click the image to view larger to see its suggested application and placement. SentrySafetyHardware is the premiere brand for panic crash bars, door closers and electronic entrance accessories. Our wide selection of tested and certified panic crash bars have been installed in hundreds of businesses across the U.S. and world. Certification helps business owners obtain a positive fire inspection report but equally as important: these certificates also convey the vigorous testing each of our models have been put through. Additionally, Sentry E. Labs accessories: exit buttons, strikes and locks are fully compatible with Sentry panic crash bars and door closers. When installing an exit system using our product line, you can take comfort in knowing that SentrySafetyHardware and Sentry Electronics Labs products will uphold the quality safety standards set forth by our founders.